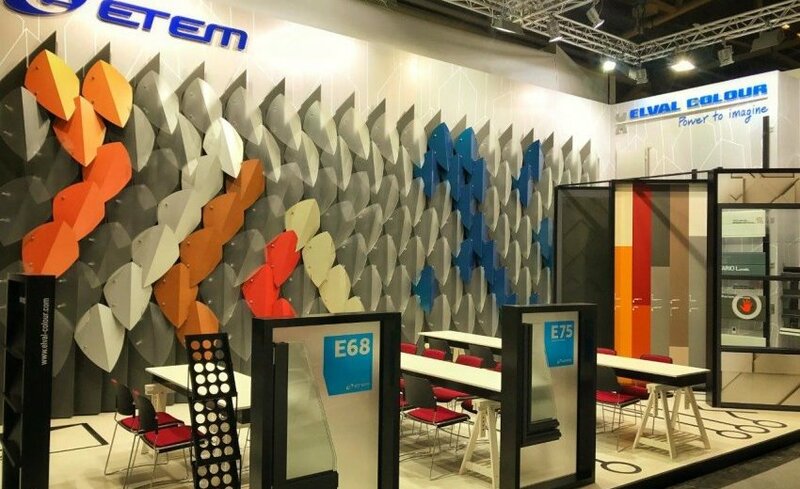 The innovative conception and the parametric design of the booth of ETEM impressed the visitors of the exhibition. The innovation concept of a façade system and partition walls with circulating fluid inside the glazing – “fluid flow glazing”(FFG) attracted great interest. They could be used both for heating and cooling, thus contributing for a comfortable and healthy environment. The FFG is developed under InDeWaG project (Industrial Development of Water Flow Glazing) financed by the European research and innovation program - Horizon 2020. The visitors’ attention was also attracted by the 3 meters high Е75 flat door with applied etalbond ® with designer’s digital printing on it. ЕТЕМ also presented the special retro design of the Е75 system, applicable mostly to buildings which have been designated as cultural monuments, the new multifunctional Е68 open system for windows and balcony doors with interrupted thermal bridge, the ventilated façade systems for mounting etalbond ® – BRAVO Y and BRAVO W, as well as the VARIO Lamella system for mounting aluminium ETEM lamellas. “We evaluate our participation in BAU 2017 as very successful and useful since we managed to attract the interest of a large number of visitors and we managed to present some of our newest products to the foreign market”, company’s representatives stated. More than 2,000 exhibitors from more than 40 countries participated in this year’s BAU Munich, while the number of visitors exceeded the expected 250,000. Due to the constantly increasing number of exhibitors and visitors this year, the organisers had provided 17 exhibition halls located in an area of 180,000 square meters. This year, ETEM participated in the exhibition for the 10th time in a row.